Winning 1st place award in environmental reporting, macksmack journalists swept a total of 10 awards in the California Press Women high school journalism contest. “What an awesome win,” said Pamela Tapia, one of the blog’s advisors and a McClymonds graduate. “We were competing against the wealthiest, best-funded, most tech-savvy suburban, private and parochial high schools in California,” she added. First place in environmental writing went to Sana Saeed, a 2013 graduate, who tackled the toxins in lipstick in her piece “Is My Lipstick A Lethal Weapon?” Her story was also entered in the National Federation of Press Women high school contest. Two seniors won top photo awards, Jonae Scott with a 2nd place in sports photography and Luckie Lovette with 3rd place in feature photography for a photo essay on tattoos. “We pulled it off with the least expensive cameras — sometimes borrowed — and without high tech devices, lighting equipment or digital enhancements,” said Tapia. Senior Lee Benson won 3rd place in environmental writing for writing “Eco-cool”, which discussed a rising trend in students bicycling to school. He also won an honorable mention in feature writing for a piece on the digital divide hurting student grades. 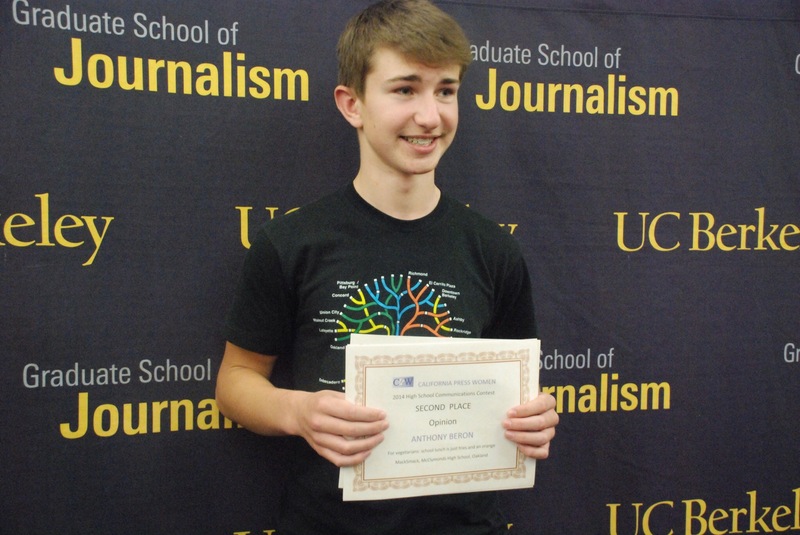 The awards ceremony took place at UC Berkeley’s School of Journalism on March 12. This entry was posted in digital divide, Environmental Justice, EPA, journalism, Newspaper Articles, School News, success, Youth and tagged California Press Women, California Press Women award, digital divide, eco-cool, ecology, environment, environmental justice, High School Journalism, journalism, lipstick, photography, tattoos. Bookmark the permalink.